Clemson, SC–Clemson Head Coach Larry Shyatt announced the recipients of team awards at the Clemson men’s baskeball banquet on Sunday evening. Will Solomon was the recipient of the Paul Bowie Award, which is presented to the team’s MVP. Solomon led the Tigers in scoring this year with a 19.7 average. 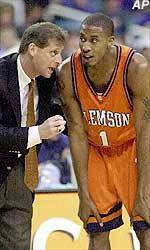 He also made 95 three-point goals, the second highest total in Clemson history, and shot 79 percent from the foul line. It was the second straight year he has won the award, the first Tiger to win the award by himself in consecutive years since Chris Whitney in 1991-92 and 1992-93. Tomas Nagys and Chris Hobbs won two awards apiece. Nagys won the Hustle Award and was the named the team’s most improved. Over the last 10 games of the season Nagys improved his field goal percentage by 25.8 percent to 46.6. He also increased his scoring average from 1.8 points a game for the first 18 contests he played to 7.1 over his last 10 games he played. Hobbs won the team field goal percentage award, with a 56.6 percent mark, and was also the team’s top rebounder with a 6.3 average. Tony Stockman, like Hobbs a first-team ACC All-Rookie team selection, won the free throw shooting award. Sophomore guard Edward Scott was named the team’s top defender. Adam Allenspach and Pasha Bains shared the team academic award. Allenspach will graduate in May. Coach Shyatt also honored game clock operator Bill Shain for his 38 years or service with a special lifetime contribution award.